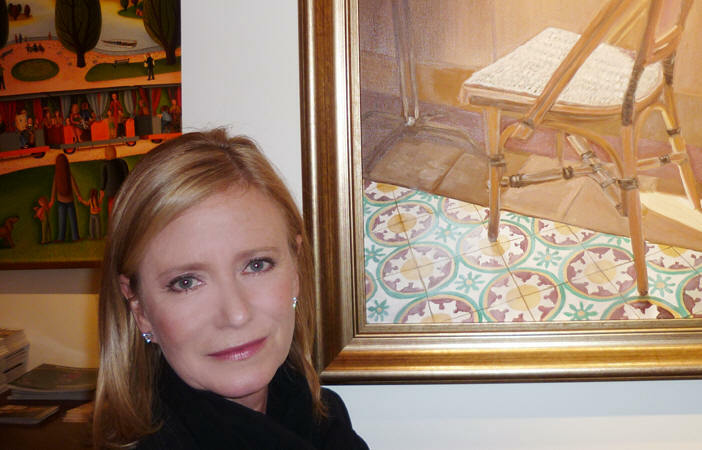 Eve Plumb at her New York art gallery showing. Eve Plumb is not your go-to Brady for back-in-the-day. With a nation still aching for any crumb, any plumb of trivia regarding the 1969-74 series, she is not biting. Not her problem. Although she has no visible gripes with the show that made her a pop culture icon, she is not going there, so don’t ask. She is living for today, and what a sunshine day it is. Even though she continues to act and audition, her true passion lies on the canvas, not the small screen. 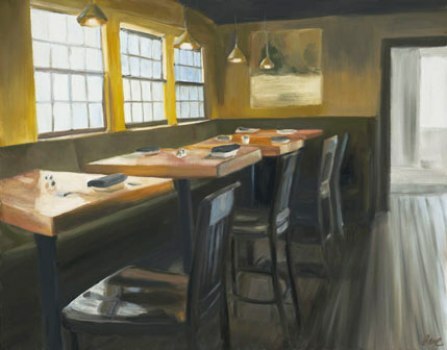 Her recent exhibit of oil paintings appeared in February 2010 at the Gallery of International Naïve Art (GINA). This was her New York art-world debut – a solo exhibition at that – in the gallery’s 2,000-square-foot space on the Upper West Side. 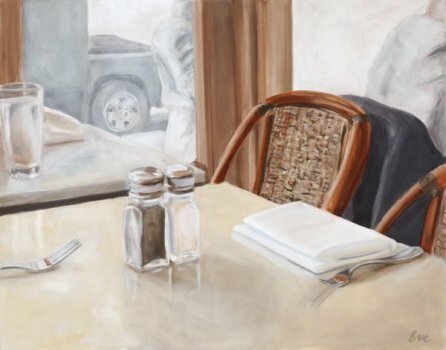 Her series of paintings, entitled “Bistro,” display her keen, detail-oriented eye on simple table-top scenes in cafes, restaurants and coffee houses. 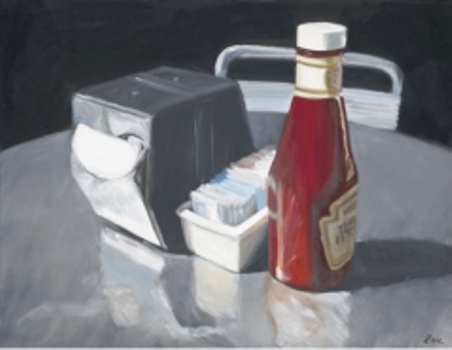 All images moody and dusky and void of human beings, her work received some serious attention from the art world. Most of its patrons quite possibly have not even seen an episode of The Brady Bunch (or admit to it), and the elegant, articulate, still strikingly beautiful Plumb does not use that seventies show as her calling card. Self-taught, she has been focusing on the quiet rewards of art for some time now. Her striving was always a factor, first apparent when she appeared in the ground-breaking TV movie Dawn: Portrait of A Teenage Runway in 1976. Gritty and bold, Dawn was a to-die-for role which left Jan Brady in the dust, but not for good. Since then, her relationship with the Brady legacy has been firmly love/hate. She picks and chooses her Brady reunion projects (infamous for declining the horrendous Brady Bunch Variety Hour, in which actress Geri Reichl filled in for her and gained the permanent nickname “Fake Jan”). Still, Plumb is perennially a good sport, gracious to fans and generally okay with our national obsession with her. In fact, coinciding with her gallery debut is her appearance with her TV mom, Florence Henderson, in a one-night-only engagement for Broadway Backwards (to benefit Broadway Cares/Equity Fights AIDS and The Lesbian, Gay, Bisexual and Transgender Community Center. This took place on February 8, 2010 at the Vivian Beaumont Theater.). Next question. And that’s all folks. The Brady reminiscing ends there. She has her art to keep her warm. Does she have a lifestyle preference between a life in art and a life on screen? “You don’t have to get dressed up as much being an artist,” she says. #1 © 2010 Ronald Sklar. All rights reserved. #2 © 2009. Courtesy of Eve Plumb. All rights reserved. #3 © 2009. Courtesy of Eve Plumb. All rights reserved. #4 © 2009. Courtesy of Eve Plumb. All rights reserved. Copyright ©2010 PopEntertainment.com. All rights reserved. Posted: February 21, 2010. Tags: art, bistro, Brady Bunch Variety Hour, Broadway Backwards, Broadway Cares, Chrome Napkin Holder, Dawn: Portait of a Teenage Runaway, Equity Fights AIDS, Eve Plumb, Fake Jan, Florence Henderson, Gallery of International Naive Art, gallery of naive art, Geri Reichl, GINA Gallery, Jan, jan brady, Newburyport Restaurant, painting, popentertainment, ronald sklar, still life, The Brady Bunch, The Lesbian Bisexual and Transgender Community Center, Vivian Beaumont Theater. Bookmark the permalink.